I spent ~$100 for the Seasonic 550W modular power supply and I was pleasantly surprised by the packaging. I thought the slight premium I was paying was for the higher efficiency but quality packaging and casing was an appreciated bonus. Each of the modular cables were cleanly bound by sleaves which made cable organization extremely easy. It was a pleasure to work with as well. The molex connectors were by far the easiest to use as well. I always thought all molex connectors were a little tricky to connect and disconnect but this Seasonic power supply’s showed me the light — I’ve just been buying inferior products from the likes of Antec and OCZ. This was the most experimental and frivoulous component of this build. I have no use for a water cooling unit because I’m not overclocking my CPU whatsoever (I favored features over more performance in my CPU). It’s not even necessarily the most quiet solution either. I bought it because I was curious. Installation was extremely easy and the performance was certainly impressive. The idle temperature of ~28 C is excellent for stock voltages and I’m pleased by the noise levels. I do have one concern though: dust. I wonder how long it will take before the internals of the computer is filled with dust thanks to the dual 120mm intake fans for the radiator. Micro-ATX motherboards are so 2010. 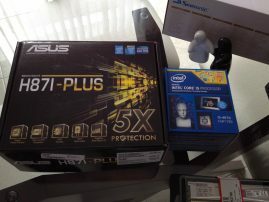 Thus, I decided to go smaller and get a mini-itx motherboard. I had good experiences with Gigabyte but after careful evaluation of features and pricing, I decided to get the ASUS H87i-PLUS. I was sold by the placement of the six SATA ports and the inclusion of an Intel gigabit NIC. Pure Intel is rare and when I transform this to a home server, it should be easier to find VMWare ESXi support for Intel NICs. 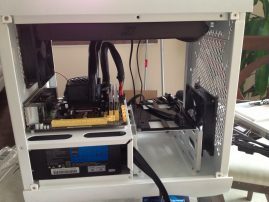 The motherboard layout worked out for my case and cooling. The Swiftech H220’s waterblock is practically kissing the capacitors lined beside the socket but that’s okay. Everything fit which was the most important point of all. Superficially, it’s one of the prettiest motherboards I’ve ever owned. It’s classy and was not gaudy at all. This motherboard’s EFI menu was also extremely easy to use. It was my first EFI experience and I was very pleased by it. My only gripe is all the extraneous options that had no relevance for my particular motherboard. The motherboard specifications didn’t mention anything about LucidLogix MVP support. So why is the option in here? This BitFenix case was the surprise of the build. I’ve read the rave reviews but I still didn’t expect it to be this good. The first thing I noticed was how sturdy it was. It did not feel like an $80 case. I own $100+ cases feel flimsier than this. There’s a methodology to installing parts into the thing and it’s highly recommended that you plan out where everything is going to go. I installed and uninstalled the PSU multiple times just to route cables properly. The case’s flexibility is incredible. Removing extra hard drive cages is the norm but completely removing the optical drive bay? I’ve never seen that before. It’s also possible to remove all hard drive cages and mount 2.5″ SSDs or hard drives on the side panels or behind the PSU cage itself. 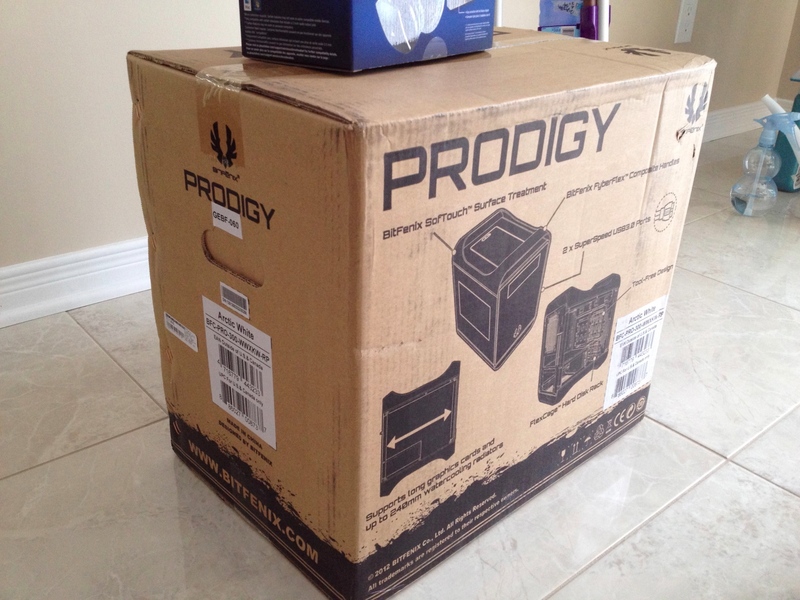 It’s a fully customizable box that can accomodate the largest of graphic cards or a full complement of hard drives. I can’t have both at the same time but it’s nice to know I can switch roles and this case can accomodate. I had alignment issues with the PSU faceplate but it’s a minor issue to an otherwise amazing case. I haven’t gone through and benchmarked the machine and I don’t intend to. It’s not my machine and all it has is a Radeon HD 5770 inside. We did measure one thing though: boot performance. This machine can boot up to the Windows 8.1 Developer Preview log on screen in approximately 18 seconds. That’s incredible. A restart of the machine can bring it back within 16 seconds. I love the progress made in this department. I am very pleased by this build. It cost me less than $1000 but that was without a new video card. 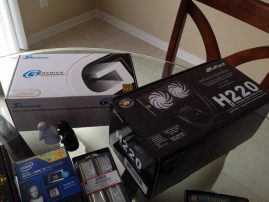 I could have saved some cash by not splooging for the water cooling but I was too curious. Still, it’s an excellent machine and I don’t regret any of the decisions I made. As for a future video card? Perhaps I’ll get a NVIDIA GTX 760 once it hits sub $200 or we’ll wait until my brother feels the need to use it as a serious gaming PC. With the workstation out of the way, it’s time to assemble the 2013 home server. P.S – I also took some pictures. I wish I took more along the way but I guess this is better than nothing.